Think of your customers as Family - St Angelo Hardwoods, Inc.St Angelo Hardwoods, Inc.
As I look back on 29 years of selling teak lumber, I have fond memories of all of the people I was fortunate enough to meet. The cast of characters varies from one end of the spectrum to the other. Some are a complete joy to be with, some took a little time to come around and some are a bit tougher but you learn to accept them for who they are as a person. Just as you do with friends and family. I recently attended the Boatbuilders Show on Cape Cod and was reminded that our customers are more than friends, but a family. There were many exhibitors and most were our customers that we provide teak and mahogany for their daily operations. I was greeted with smiles and a friendly handshake from everyone I went to visit. We are familiar with each other. We know things about each other both in business and in our personal lives that only comes from a relationship that has been nurtured throughout the years. It is a mutual respect for one another and our goals in business and in life. This is something that we as business owners should strive to achieve. It should be a working relationship that benefits everyone equally. The almighty dollar should not be first and foremost in your mind. Although it [money] is what makes a business succeed and keeps the wheels spinning, it is my opinion that money should never cloud your good moral judgment. 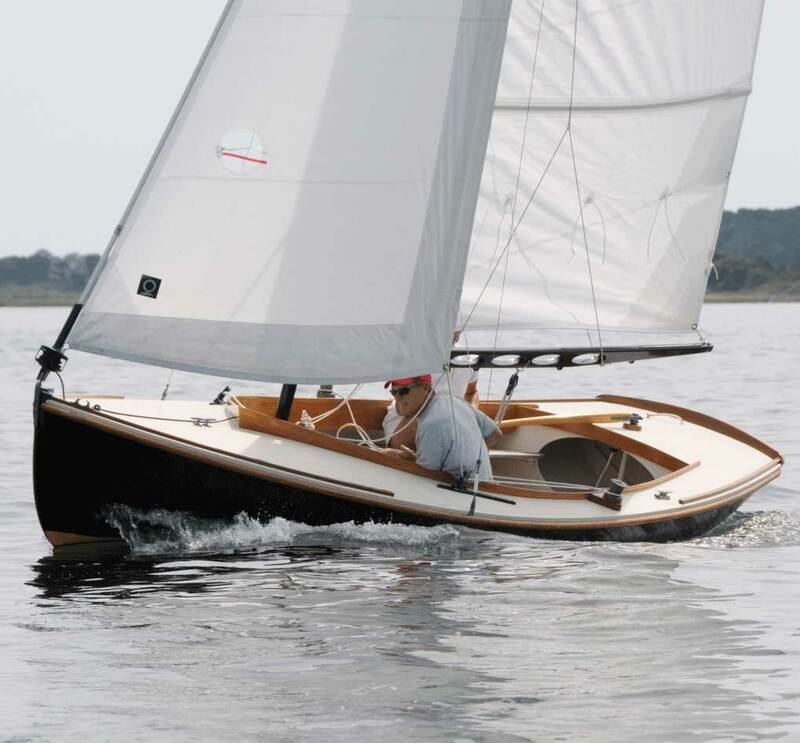 I spent time talking with David Foynes of Fatty Knees Boat Co. from Sagamore Beach, MA. 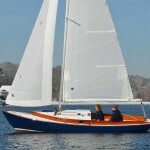 David was there showing off his beautiful 8’ sailing dinghy which was fully rigged and ready to go. We spend time with David picking particular pieces of teak while matching patterns provided. This was the first time I have seen the finished product. 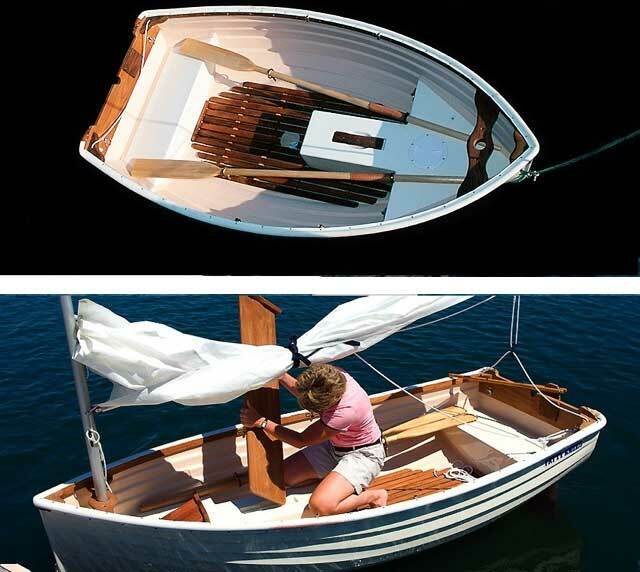 The teak trim, daggerboard, floorboards and varnished ash tiller complement this Lyle Hess designed sailing dinghy. To see what the crew at Fatty Knees produces from the rough sawn lumber they leave the warehouse with fascinates me. It gives me a sense of pride to know we had a very small part. I also spoke with Wendy Goodwin, President of Cape Cod Shipbuilding in Wareham, MA. 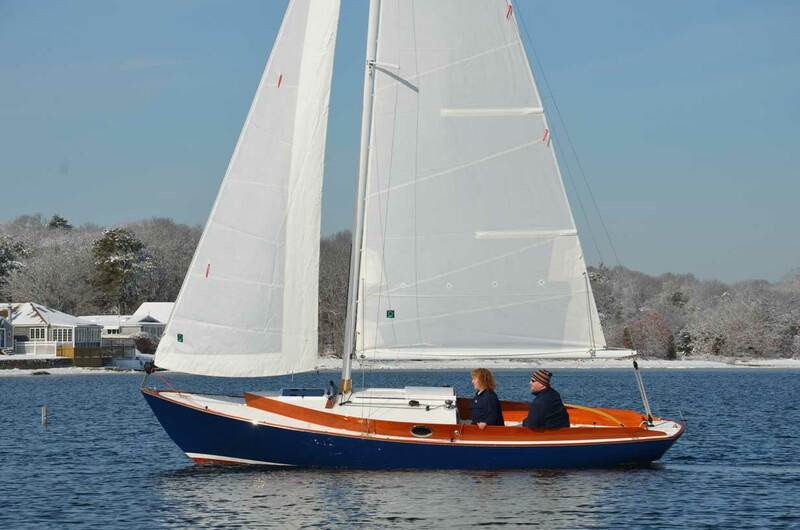 As we looked upon their Marlin Heritage 23, a Herreshoff design, you couldn’t help but be in awe. The beautiful high gloss mahogany toerails, coamings, taffrail & accents makes for much eye candy to accompany a wonderfully designed vessel. The teak companionway door and interior trim was selected by St. Angelo Hardwoods. (full disclosure, we did not supply the mahogany which is beautiful. I wish we had the stock to accommodate their needs) As Wendy presented this gorgeous lady to the crowd, her eyes lit up, smile on her face and again, very proud of what she accomplished. It made me feel great that again, St. Angelo Hardwoods has a very small part. Tony Davis of Arey’s Pond Boatyard in Orleans, MA is a long standing regular at our facility. Sometimes I think it’s more fun because we get a visit from Wolfie. A beautiful German Shepard and Tony’s trusted companion. Tony takes great care to select only the finest pieces of lumber for his line of vessels. 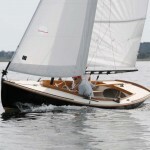 Arey’s Pond Boatyard custom builds your vessel from 12’ right up to 29’. 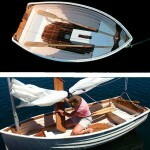 Teak, mahogany and oak are only some of your choices for a trim package. While speaking to Tony at the show, he had a wide smile on his face and was happy to swoon around his display just as proud as you could be. You see, we all work together to make something wonderful happen. A business and its customers are a support system which is needed in virtually every aspect of life. Take pride in your customer’s accomplishments and know that you had a part in making it happen. Support them and help in whatever way you can. Some need extra time for finances. Some need a bit of advice. Some may want to vent about their frustrations. You listen. You help. You treat your customer as you would any other family member. When you do this, you will know that your business is a success. One big happy and successful family.